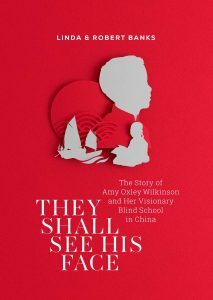 Jenny Tasker reviews They Shall See His Face: The story of Amy Oxley Wilkinson and her visionary blind school in China. Amy Oxley Wilkinson was the first CMS NSW & ACT missionary to be sent to China, arriving in 1895. Jenny Tasker is a distant cousin of Amy Oxley Wilkinson. This meticulously researched biography by Robert and Linda Banks is a delight to read. It is not a tedious list of dates and places, but an engaging and very accessible story of one of Australia’s earliest missionaries to China. Drawing on a rich legacy of letters and documents, and sprinkled with family anecdotes, photos and snippets of the wider society at the time, Amy Oxley’s story progresses through her childhood in Sydney, her growing love of Christ and interest in mission, through to her years serving in China and then England. Amy founded the Soul-Lighted School, a blind school for boys in Foochow (modern day Fuzhou). It was a remarkable establishment in a country in which the disabled were often left to die or beg in order to survive. It was also set up in a climate of social and political upheaval, with missionaries and converts facing the very real prospect of death. It was a remarkable establishment in a country in which the disabled were often left to die or beg in order to survive. Amy’s school sought to provide academic, physical and spiritual learning opportunities so that the boys would be well-rounded and self-sufficient. The focus was on the whole person, made in the image of God. It was a powerful witness to the love of God, translated into a ministry to the needy and marginalised. Yes, this is a book about a woman who did amazing things in difficult circumstances. But above all, it is a reminder that God was at work throughout Amy’s life, bringing her to the places of his choosing, in his timing, so that she might show his love through practical and spiritual ministry to some of the most vulnerable in the world. It is a reminder that there is cost and sacrifice in serving the Lord, with Amy’s rich letters giving a window into the challenges of language, culture, food, climate, distance and politics, but also the joys and rewards of serving the Lord—not so different from missionaries today! In 1896, Amy wrote, “I am so glad to be in China, for I begin to see how much these people need Jesus.” Those words are as true for all people groups today as they were 122 years ago. CMS Victoria provided funding through the Keith Cole Publishing Fund for the extensive research that Robert and Linda Banks did in China, Australia and the UK for the writing of They Shall See His Face. Copies are available to purchase through Koorong, or you can find information about e-book retailers here.